The Amah Mutsun Relearning Program is stewarded by Rick Flores, Curator of the California Native Plant Collection, Associate of the Amah Mutsun Land Trust. Rick was recently interviewed on local radio station KZSC's Food Speaks program about the development of the Relearning Program at the Garden. 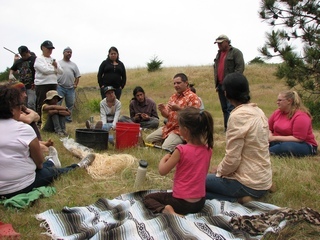 The Amah Mutsun Relearning Program (AMRP) at the UC Santa Cruz Arboretum & Botanic Garden is a collaborative effort between the Amah Mutsun Tribal Band (AMTB) and the Garden to assist the Tribe in their efforts of cultural revitalization, recuperation and relearning of dormant cultural knowledge, and environmental justice. This unique process of relearning combines science, research of Smithsonian ethnographer John P. Harrington’s interviews with Mutsun elder and tribal matriarch Ascension Solorzano, and other Mutsun members, in the late 1920s, oral histories of Amah Mutsun tribal members, and knowledge and information from surrounding California Indian tribes with similar cultures. 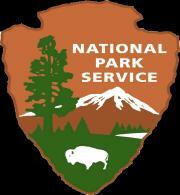 The AMRP serves multiple purposes. First it assists in these efforts to relearn indigenous knowledge particularly as it pertains to traditional ecological knowledge (TEK), traditional resource and environmental management (TREM), and the ethnobotany of California native plants. The value of relearning indigenous botanical knowledge for Amah Mutsun tribal members was highlighted in a recent article, "Reviving From the Roots Up: Amah Mutsun tribe relearns indigenous botanical knowledge". The importance of reviving traditional ecological knowledge to more effectively address contemporary environmental problems has been acknowledged by scientists and the U.S. Forest Service. 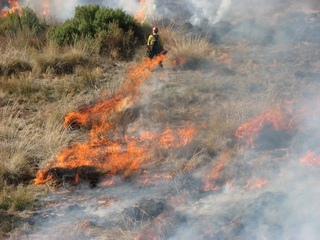 The AMRP was highlighted in an article, "Native traditional methods revived to combat California drought, wildfires", that discussed the revival of these traditional Native American land management practices. The Garden's California Native Conservation Gardens (CNCG) provide a place where Tribal members can relearn plant identification and uses of native plants while incorporating TEK and TREM into the growing and management of the plants which the Tribe can then sustainably harvest for cultural practices. Second, the CNCG serves as a research garden where TREM practices can be tested and the results of this research can be used to inform other collaborative projects in the area, such as the restoration work at Quiroste Valley Cultural Preserve and Pinnacles National Park; and to inform land owners and managers about the best practices to manage cultural resources for healthy and resilient ecosystems. 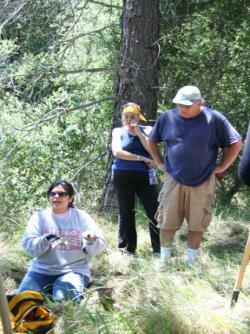 Third, the AMRP will use interpretation and events to educate UCSC students and students of all ages, and the general public about the importance of indigenous cultures and their knowledge, the history and contemporary issues of the AMTB, ethnobotany, TEK and TREM, and California Indian lifeways – and how these relate to contemporary efforts to restore degraded landscapes in California. Finally, the AMRP collaborates with the Amah Mutsun Land Trust (AMLT) and our project partners who work as allies and in solidarity with the AMTB in their efforts to restore and conserve indigenous cultural and natural resources within their traditional territories, steward their lands and waters, research TEK, and educate their tribal membership and the broader public. While the groundwork has been laid for the Relearning Program to become a reality, there is still much to be done. Working from a comprehensive plant list provided by the Amah Mutsun, plants are being identified in the Garden’s existing collections and collected in wild habitats. Infrastructure for the CNCG such as irrigation lines, pathways for visitors, and deer fencing need to be installed as a foundation for further development. Interpretation and educational events are being considered as methods for sharing these resources with generations to come. Funding for all efforts of the Relearning Program is being sought from public and private donors, and grant opportunities. Without the involvement of the greater community, this inclusive and unique program cannot thrive to its fullest potential as a resurgence of cultural knowledge and ecological awareness. The research and educational value of this program are immense in terms of recuperating dormant cultural knowledge, incorporating TEK into contemporary land management practices, and future collaborative efforts in conservation and preservation. 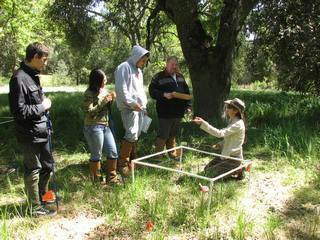 Please join us in supporting the Amah Mutsun Relearning Program at the UC Santa Cruz Arboretum & Botanic Garden today! Visit the Garden's online donation form and in the box that says "Notes or Special Instructions for your Gift" specify that your donation is for the Amah Mutsun Relearning Program. The AMRP is stewarded by Rick Flores, Curator of the California Native Plant Collection and Associate of the Amah Mutsun Land Trust. Read more about Rick's role in developing the Relearning Program at the Garden. A printable version of this page (PDF) is available. Together, we can make a difference in the lives of all of our future generations—the people, the plants, the earth.